Scottish Labour leader Iain Gray has used his party's conference in Glasgow to dismiss first minister Alex Salmond as "David Cameron's doorman". Mr Gray accused the SNP of wanting to help see in a UK Conservative government after the next election. He told delegates that Labour would protect public services and jobs, and fight crime in communities. And he called on party supporters to hit the streets to campaign hard for the forthcoming election. Mr Gray accused the SNP of "ushering" Margaret Thatcher to Downing Street in 1979, "bringing about a disaster for Scotland". He told the conference in Glasgow: "On Thursday, Alex Salmond called me [Scottish Secretary] Jim Murphy's placeman. "But it is a bit rich coming from the man who would be David Cameron's doorman. "When Alex Salmond talks of hanging Westminster on a Scottish rope - the rope he is talking about is a Tory rope." Mr Gray went on: "It is the same Tory rope which hung our mining, steel and shipbuilding industries in the 80s - and it is the same Tory rope which would choke off our recovery this time round." He hit out at the SNP's record as the Scottish government, saying it had failed to keep manifesto commitments such as scrapping student debt, while policies like replacing council tax with local income tax had to be dropped because of a lack of support at Holyrood. "Here in Scotland, we do not have to wonder what happens when you let in an airbrushed politician with photoshopped policies. "We do not have to wonder what happens when you let in someone who will say anything anytime to anyone to get elected - we have Alex Salmond." The Scottish Labour leader, who told how he had become a grandfather for the first time to three-month-old Lucy, told delegates: "Lucy's mother was born in 1979. She grew up knowing nothing but the Tories. "I am damned if I am going to let that happen to another generation of Scots." 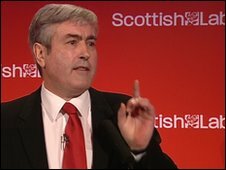 The Scottish Labour leader said Prime Minister Gordon Brown and Chancellor Alistair Darling made the right choices to steer the country through the recession, including bailout action to save Scotland's banking sector. Turning to the election campaign, Mr Gray urged members of the party to keep "pounding the next street", declaring: "What binds us together is so much more than whatever divides us. "Stand up for Labour - because Labour stands for Scotland."